The quality of this carbon fiber is far better than any other. Save your time comparing with other brands foreign or domestic. It's not the least expensive but it is the best looking and best made. The toughest part of getting this was deciding if I should mount it or leave it on my table to gaze at. It truly is a piece of art. 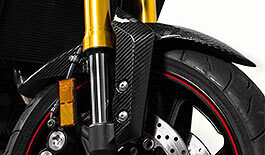 Advantages: Lighter weight than stock ABS plastic fender. Easy install. Enhances look of bike especially if you have gray, black, red color. Yamaha should contact with TST make this a stock part. It really is the best.